The Central Council for Research in Homoeopathy (CCRH) is taking this as an opportunity to review the path trodden so far, taking stock of the challenges faced and to formulate future strategies for development of Homoeopathy. New Delhi: A two-day convention is going to be organised on 9-10th April 2019 by the Central Council for Research in Homoeopathy (CCRH), an autonomous research organisation, Ministry of AYUSH on the occasion of the World Homoeopathy Day at Dr Ambedkar International Centre in New Delhi. 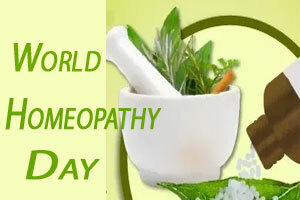 The World Homoeopathy Day is observed to commemorate the birth anniversary of the founder of Homoeopathy, Dr Christian Fredrich Samuel Hahnemann. The Convention will be graced by Shri. Vaidya Rajesh Kotecha, Secretary of AYUSH, Sh. Roshan Jaggi, Joint Secretary, Ministry of AYUSH, Sh. Nilanjal Sanyal, Chairman, Board of Governors, Central Council of Homoeopathy and Sh. Tridandi Chinna Ramanuja Jeeyar Swamiji. Tributes will be paid by Dr Gary Smyth, President, Faculty of Homeopathy, the UK and Dr Alok Pareek, President, LMHI (International). With an aim to recognise exemplary work in Homoeopathy, AYUSH awards relating to Homoeopathy for Life Time Achievement, Best Teacher, Young Scientist and Best Research paper will be conferred on this occasion. This WHD, 24 students will be awarded scholarships under the Short Term Studentship in Homoeopathy (STSH) and four students for ‘Quality MD Dissertation in Homoeopathy’. MOU’s will be signed with two more PG Homoeopathic Colleges with an effort to link education with research. The vision behind the agreement would be to provide impetus to research infrastructure, which, in turn, further orient the students towards research. A wide range of topics will be covered in the convention like Linking education and clinical practice with research, Homoeopathic Education: Research component, Utilisation of existing research by clinicians , Drug Development & Validation, Research initiatives by students under Studentship & MD Scholarship schemes , Documented clinical experiences, Homoeopathy in public health, Fortifying theories and clinical practice with research, Road ahead for Homoeopathy, Skill development in scientific writing, Strengthening research infrastructure in educational organisations, Drug Provings and Guidelines for Publishing Research. Round table discussions are also planned on the topics ‘Drug Regulations in Homoeopathy: Current scenario and Way ahead; Homoeopathy Industry: Challenges and Opportunities for the Manufacturers/Traders; Homoeopathic Pharmacopeias: Standards and Harmonisation’ and ‘Promotion of Homoeopathy at state level: Government of India schemes as a facilitating tool; Homoeopathy doctors in public service: Roles & Responsibilities’. The Council is taking this as an opportunity to review the path trodden so far, taking stock of the challenges faced and to formulate future strategies for development of Homoeopathy. There is an imminent need to focus on improving the quality of education and enhancing the success rate of an average practitioner. There is also a need to ensure the production and availability of high-quality homoeopathic drugs in the market.